Tobyn Horton says Mark Cavendish's decision to help coach riders on his Madison Genesis team could help achieve his dream of riding the Tour de France. Cavendish, the Tour's green jersey winner in 2011, has agreed a deal to support the team next year. "I'm 30 next year so the chances get slimmer, but I never stop striving to want to do it," said Horton. "Mark putting his name to the team will allow us to be in the shop window at bigger races." Horton is one of Guernsey's greatest-ever cyclists and helped Madison Genesis to their first-ever Tour Series title earlier this year. 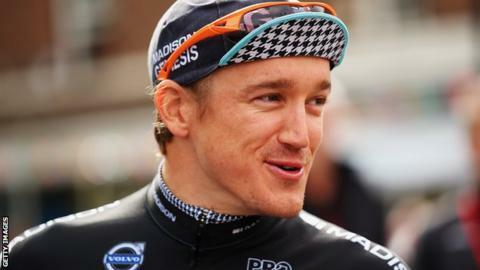 "One of the things I like about Madison Genesis is they're constantly pushing as a team to develop and push the boundaries," Horton told BBC Radio Guernsey. "They're not happy at just being one of the best teams domestically in the UK, they want to do something different and to have someone like Mark Cavendish put his name to the team shows how well admired Madison Genesis are."